How would you or the Dad in your life like something that’s both handy indoors and out, works, and is affordable? Something from Blubandoo is all of this as well as unique. I first found out about Blubandoo while researching green gift ideas for Dad for Father’s Day. The idea behind their products seemed too good to be true, so I knew I had to check it out. The company sent me a NeckBandoo to review, and is offering an even bigger package for free to one of my blessed readers! Blubandoo is a company that makes “cooling headwear“…that is, headwear like hats, bandannas, doorags, and scarves that, well, stay cool! Their products are made in California and are packaged by people with developmental disabilities so you’ll be supporting both of these things when you purchase from Blubandoo. The headwear actually takes on a cool temperature and stays that way thanks to the “magic cooling crystals” that are sewn into each item. All you have to do is submerge the headwear into cool water for 5 minutes. During those five minutes, you’ll see a part of the headwear expand as the crystals absorb the water and turn into a soft gel. Blubandoo claims that their products will stay cold for hours. After preparing the neckbandoo they sent to me though, mine stayed cold for one week. I’m not exaggerating! We couldn’t believe it. It took a few more days to fully dry out the Bandoo. Once dry, it goes back to being flat and the crystals feel more like big granules of sand. You can continuously reuse your Bandoo, hand washing it in between wears if it’s dirty. I asked Blubandoo what the crystals are made out of, and they couldn’t tell me as it’s a bit secret. Even though I’m a little disappointed about that (what a great science lesson! ), the company assures the public that the crystals are non-toxic. Enjoy our mesh caps and cool wraps (cool ties)for outdoor sports like golf, tennis, cycling,running, and hiking. 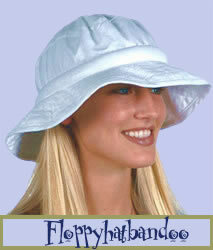 Our floppy hats and visors are great for gardening, fishing, boating, the beach and other summer events. Neckbands and headbands are popular for heat stress safety and heat stroke protection, construction work, and as medical treatment for headaches and muscle aches,and menopausal hot flashes. 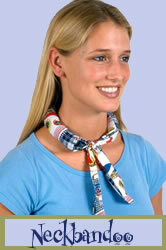 Our cooling bandoorags are worn as bandannas, cooling scarfs and as biker (motorcycle) doorags. I’d like to add to that list: pregnancy. This would be an excellent item for the expecting mom–I keep thinking that I had something like this to have kept me cool at night while I’m trying to sleep! I really think that this is a great product, well made, and that everyone could use. Blubandoo is offering both a neckband and floppy hat (that’s reversible and with SPF 50+ protection!) to one of my readers– a $30.90 value if bought separately. You can choose between white and khaki for the color. To gain your initial entry (you must do this before gaining any other entries), you need to go to their website and tell me what product you’re most interested in and in what color. Unfortunately, we’re missing the charger cord for our camera’s batteries, so I can’t post any photos of this item. It looks better in real life than what they’ve got on their website, but there is a great video on their website that allows you to see and understand the cooling aspect of their headwear better. Check it out! This contest will end Monday, June 29 at 0730 hours EST. The Safari Hatbandoo in moss would be perfect for my work at the Preschool. I would be setting a great example, in style. Love it. I like Blubandoo Aromatherapy Peppermint Pouch blue. I really like the Safari Hatbandoo in moss. I would be great for all my summer hiking trips. I like the safari hatbandoo in moss. thanks! My favorite product is by far the floppy hat bandoo in the khaki color. I work outside quite a bit and the temperatures get very high in SC so this would be a perfect way to keep cool! I also like that they offer protection from the sun! I emailed 5 friends along with you. Thanks! I've seen these before. I think they'd be great for working in the garden. I like the summer dots fabric of the neckbandoo. The Blubandoo Herbal Pack looks great as well. I like the Rainbow Flame Neckbandoo. I love the Floppyhat Bandoo in Red Tropical. I entered your Pro-Tech-Skin Giveaway. I love the white hat! What a cool (pun intended) product 🙂 You're right, it would be a lifesaver for pregnancy! Thanks for the giveaway! I like the Bandoorag in black. Thanks. I like the Sun Activity Hatbandoo in Spruce-Black.